Tonight my girlfriend’s family is coming over from Czech Republic to stay with us for a few days. This means our apartment will be filled with laughter, joy and unpredictable shenanigans with embarrassing yet hilarious consequences. Being embarrassing yet hilarious is kind of what I do, even if the “embarrassing” part is the only one I can pull off consistently. This also means that I probably won’t be around to write up embarrassing yet hilarious posts for you. Don’t judge! 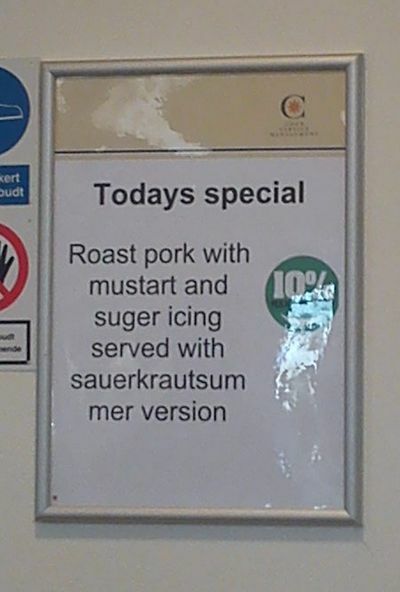 Mustard Tart is apparently a thing that totally exists, so who can blame our canteen for deciding to abbreviate its naming? And then serving plain mustard instead…? On that confusing note I’d like to bid you all farewell for a few days and wish you an awesome weekend! May it be both hilarious and embarrassing. hahaha, spelling doesn’t seem to be a requirement for running a food stand. But hey, maybe it’s a brilliant marketing ploy…think about it…you’re walking by….you read….you say, what the…? All the while you’re standing there scratching your head, when it hits you …. Hey! I’m hungry! @dianasschwenk Hehheeee that is a smart strategy indeed! And now that you mention it…I could eat a bit of sauerkrautsum myself! Mer Version! Just one question: is sauerkraut at the sea made from seaweed? Maybe it’s German sushi! First it you leave to work harder! Now, you’d rather spend time with family , then entertain us! As always, great laughs to start my day! @crubin Happy to give you some good laughs as always, hope you have an awesome weekend when you get that far!